So crispy. So fresh. bakery-fresh flavor. Forget dry protein bread. Discover your new favorite. Crispy on the outside. Fluffy on the inside. Filled with selected seeds and superfoods. Just as tasty as the fresh-baked stuff from the bakery down the street. Our protein bread will revolutionize your breakfast. And your lunch. And your dinner. There are plenty of protein breads. But they're all so dry. And too hard. We can do better. How? Because we don’t use gluten, additional starch, or synthetic binding agents. And we make good use of all that free space. We use all-natural ingredients and protein sources. After all, more isn't always better. Plenty of protein? Of course! Just a little different than you might think. A whole 10g of protein and just 2.0g of carbs. That's just 2 crispy slices of our protein bread. ** (Classic wheat bread is the complete opposite. Seriously.) How do we do it? Grass-fed milk. Egg protein from free range chickens. Almond flour. Superfoods. You're welcome. A whole 11 g of protein and just 2 g of carbohydrates. That is what 2 crispy slices of our protein bread delivers. ** As a comparison: It is exactly the opposite in the same amount of classic wheat bread. This is due to an elaborate combination of different sources of protein. The protein kick is delivered by milk and egg proteins. One comes from pure pasture milk. The other from free range chickens. It is all rounded off with a perfect blend of almond flour and superfoods. 1. Pour the entire baking mix into a bowl. Combine with water. 2. Place dough onto a greased or baking paper-lined tray or dish. 3. Bake on middle shelf in a preheated oven at 175°C for approx. 40-50 mins. The exact baking time may vary depending on your oven. 4. Let cool. Slice. Enjoy. Looking for a new favorite recipe? Check out our recommendations. We'll tell you all our secrets. *** For baked bread made using the entire protein bread baking mix. 1 slice of our protein bread should weigh an average of 25g. Actual weight and nutritional values may vary slightly. Dry mixture for producing gluten-free baked goods. A varied and balanced diet and a healthy lifestyle are essential. May contain traces of soy, peanuts, and other nuts. Add 230 ml water to the baking mix and combine until dough is even. Leave dough to rest for 30 minutes. Knead for a few moments. Place dough on a prepared baking tray or into a greased baking dish of your choice. Bake on middle shelf at 175°C for approx. 40-50 minutes. Note: The exact baking time may vary depending on your oven. Baking with convection heat may reduce the baking time to approx. 40 minutes. Our Protein Bread is completely free of preservatives. We recommend consuming your freshly baked bread within 2 days. The bread can also be stored in individual portions in the freezer and thawed as needed. Stick a knife vertically into the thickest part of the bread. If it comes out clean, then the bread is done. One baking mix (230g) produces about 360g of bread. This is how we like it. Spread avocado evenly over both slices of bread. Add spices according to taste. Distribute arugula over both slices. Cut beetroot into thin slices. Place beetroot slices on top of bread. Add mache to both slices. Cut goat cheese and figs into thin slices. Alternate them and place on top of the bread slices. Spread about 1 tbsp peanut butter on both slices of bread. Cut banana into thin slices. Spread banana slices over the bread and sprinkle with some cinnamon. Heat up fruit and then let cool. Place in a blender with chia seeds and puree. Let cool in the fridge overnight. Spread on the protein bread and enjoy. It is so easy to bake this bread and the result comes very good. The seeds in the bread makes the bread so tastry and healthy. I will continue buying from this bread. Gillar inte riktigt konsistensen på brödet. Känns som att tugga på en disksvamp, men med gott pålägg, (Kör på keso, kyckling/kalkon och lite färska spenatblad/gurka) så går det ner hur lätt som helst. 2 små skivor på 130kcal mättar och ger energi. Perfekt om man vill gå ner i vikt men inte vill gå runt hungrig. Who should use protein bread? 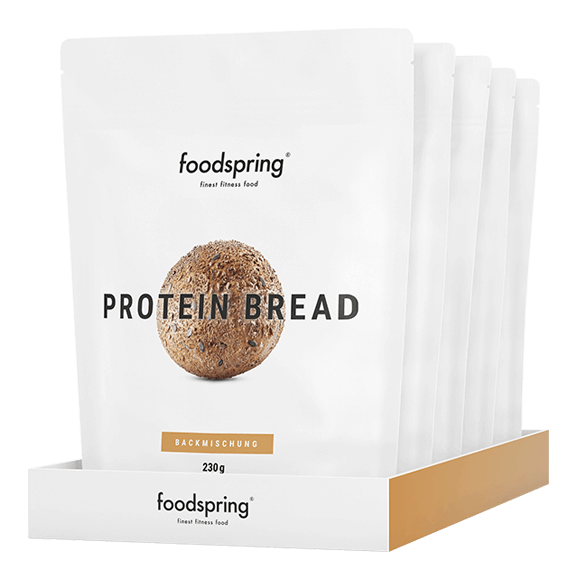 foodspring protein bread is a bread baking mixture that contains premium proteins as well as select seeds, grains and superfoods. What makes us different to any other protein breads? It’s simple. The flavour and the ingredients. Our protein bread is as tasty as any fresh bread from a bakery. And all that without any gluten or soya. Instead, we use almond flour, seeds and superfoods. That all sounds great, but you can’t really bake? You don’t need to. The baking mixture is simply mixed with water. You don’t need any other ingredients. Leave the dough to rest for about 30 minutes. The bread is now ready to bake. Baking time is around 50 minutes. Protein bread is the perfect addition to any fitness-conscious diet and a delicious source of protein for athletes as well as anyone who wants to eat less carbohydrates. Uniquely delicious – like fresh bread from the bakery. Protein bread is a fantastic food to eat if you are looking for an extra boost of protein, especially when you are building muscle mass. Aside from shakes, bars and protein porridge, protein bread is a savoury alternative for that quick portion of protein for breakfast, between meals or as a post- workout snack. Just 50 g of protein bread (2 average slices) deliver 11 g of protein. Protein bread is especially suited to low-carb phases, as two average slices only contain approx. 2.5 g of carbohydrates. ** Protein bread can also help meet your protein needs when you are dieting. The fibres contained in the seeds, grains and almonds combined with the high protein content in our bread will leave you feeling fuller for longer. Anyone who lives a fitness-oriented lifestyle and would like to enjoy a treat without feeling guilty. Our protein bread combines different protein sources, is soya and gluten-free and contains nutritious seeds and superfoods. Just 2 slices will give you a good dose of protein and healthy fats. Protein bread is the perfect high protein side for soups or salad, both on its own or with a savoury topping. As protein bread can have both sweet and savoury toppings, it is perfect to eat with breakfast, dinner or as a healthy snack between meals and on the go. Just the way you like it. Our protein bread is a perfect lower carb alternative to regular bread and will enhance your daily meals with a healthy dose of protein and healthy fats that come from the linseeds, almonds and sesame. It is a perfect addition to any fitness-oriented lifestyle and as part of your everyday meal plan. Athletes can also benefit from using protein bread when muscle building or during definition or diet phases as part of a balanced diet to get that extra dose of protein. Our protein bread is suitable for a low-carb diet plan. Protein bread tastes best – like most breads – when freshly baked. Once made, it can be kept at room temperature for approx. 2 days. If you want, you can also cut it into slices and put them in the freezer, then toast them whenever you feel hungry. The difference between various types protein breads that are offered online can be substantial. Having a look at the list of ingredients can be well worth it: The list should contain few but natural ingredients. High quality baking mixtures tend to steer clear of artificial additives and conservatives. You should also read the preparation instructions carefully: Lots of baking mixtures require additional ingredients that you will need to buy before you bake. Pre-baked and packaged breads are also rarely as delicious as a freshly baked loaf of protein bread. Lots of protein breads are mainly based on gluten. Wheat protein is a good source of protein and a great binding agent. But it tends to be problematic for anyone with allergies. Our baking mixture is gluten-free, so anyone with allergies or gluten intolerance as well as non-allergic people can enjoy our protein bread. Why is protein bread better than wheat bread? Because protein bread has nutritional values that take you further. Two average slices contain a whopping 13g of protein, but only 3.5g of carbs. *** It also has a whole lot of healthy fats and micro nutrients from grainy superfoods. You’ll stay fuller for longer, because our protein bread is particularly high in fiber. A total win over white flour products. Can I eat protein bread every day? Yes, our protein bread is suitable for daily consumption. Like with any diet that is rich in protein, you should make sure to drink enough water. As a rule of thumb, those who consume more than 1.5g of protein per kg of body weight daily should also drink at least 2-3 liters of water per day. What kind of consistency does protein bread have? Soft and fluffy, but it feels firm when you bite into it. The high protein content ensures a soft and fluffy consistency, while the superfoods and seeds create that firmness. And the crust? Irresistibly crispy. By the way, don’t be surprised if the dough is a bit too runny when you first mix it with water. Once you’ve let it rest for 30 minutes, it should have the perfect consistency to knead and shape. How much fat does the protein bread have? Two slices of protein bread contain 3.8g of fat. ** The fats come from the seeds and grains. Flax seeds, almonds and sesame seeds contain healthy fats. There are no trans fats or cheap oils in our protein bread. How long can I store a loaf of protein bread? Our protein bread can be kept in a bread bin at room temperature for approx. 2 days after it has been baked. Our protein bread, in contrast to many other protein breads, doesn’t contain any artificial additives or conservatives. If you want to enjoy it for longer, then simply slice the bread once it has cooled and freeze the slices in a freezer bag. You can then either thaw or toast the bread slices in your toaster as desired. Freezing does not alter the high protein content of our bread. Why is the package so small? Because we don’t use any artificial ingredients or conservatives. Because our protein bread is solely made using high quality and natural ingredients, it is important to bake it fresh every time you’re craving a slice. If you want even more out of it, then our pack of 5 is just the right thing for you. This saves you 10%, and you can bake as much as you want. Protein Bread 5 pack will be back in stock shortly.